The Gr.B. match between West indies and Bangladesh at Mirpur, was over even before the spectators could settle down. A pathetic one sided ,worse than a lower division match at any district levels. Bangladesh batting first, were gunned down by Roach, Benn and skipper Sammy for 58 runs in 19 overs. Roach the man of the match ripped through for an excellent 6-0-19-3 ,supported by Benn 5.5=2-18-4 , and Sammy 7-0-21-3. 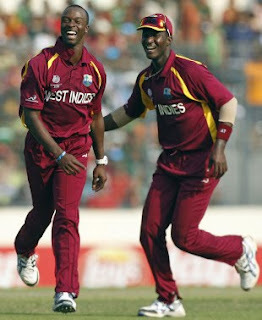 West Indies lost DS Smith, bowled by Naeem Islam for 6. Gayle and DM Bravo, batted out the Bangladeshis, with an unbroken second wicket partnership of 30 runs, and the match was over in the 13th over. The whole match lasted for 31.1 overs, and the gullible public and viewers world over were taken for a jolly good ride. What a waste.